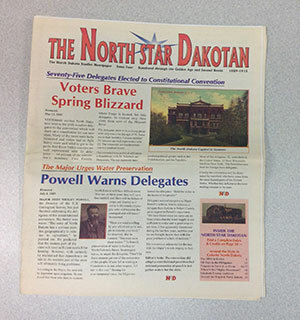 In February 2015, the North Dakota Studies program of the State Historical Society assumed ownership of the North Star Dakotan (NSD) as well as the plan for publication of a new edition. This newspaper for grade school students was the brainchild of the late Ev Albers, former director of the North Dakota Humanities Council and Jerry Tweton, professor emeritus of History, UND. The North Dakota Humanities Council published five editions of the NSD beginning in 1993. Issue #4 of the North Star Dakotan covered the time period of 1889 to 1915, or statehood to World War I. At a time when there were few curricular materials available for the study of North Dakota history, the Humanities Council filled the gap with the North Star Dakotan. Each edition covered a period of time from the time of the dinosaurs to 1972. Teachers used the North Star Dakotan in their classrooms with a good response from the students. Today, the previous five editions can be found online at ndstudies.gov. Planning is underway now for the North Dakota Studies program to write and publish the sixth edition in September 2016. The articles will be written by experienced writers with expertise in the subject matter. The articles will run from 100 to 1000 words in length. The sixth edition of NSD will cover the time period from 1972 to the present. 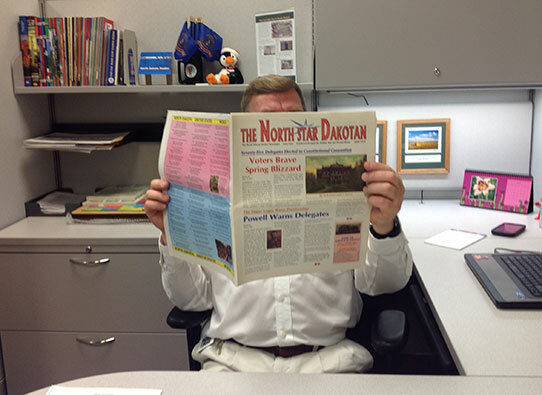 Neil Howe, Coordinator of the North Dakota Studies program, reads North Star Dakotan Issue #3. In addition to the usual newspaper-style articles that the first five editions presented, there will be editorials, political cartoons, and a cartoon strip. The sixth edition will include, as did the first five editions, a three-part timeline of world, United States, and North Dakota events. The North Star Dakotan will be published online saving the cost of paper and postage. An online publication corresponds to the use of electronically-delivered materials in most North Dakota classrooms. Of course, that means that the NSD will be available to all readers, everywhere, at any time. Will wonders ever cease? Barbara Handy-Marchello, Ph.D., is a historian and writer for North Dakota Studies.